A skin cancer screening can save your life – literally. According to the American Academy of Dermatology Association, 9,500 Americans are diagnosed with skin cancer every single day. Early detection of the 3 most common types of skin cancer by Spring dermatologist Dr. Perri of Perri Dermatology is key to diagnosing skin cancer before it spreads. While you should have a skin examination every year, here are the 3 most common skin cancers, and the signs you need to be on the lookout for in between your annual skin screenings. Basal cell carcinoma, also referred to as BCC, is the most common type of skin cancer. While Spring dermatology patients with fair skin are more likely to develop BCC, people of all skin tone types can develop basal cell skin cancer. Basal cell skin cancer appears like a pearl-like, flesh-colored bump or a pink patch of skin. While this may look like a harmless discoloration of the skin, it isn’t. Years of sun exposure without using sunscreen, or using harmful tanning beds, can cause Spring dermatology patients to develop BCC anywhere on the body, but most commonly on the hand, neck or arms. Getting an annual skin cancer screening is key to finding this most commonly diagnosed version of skin cancer. Early detection is key to prevent the cancer from spreading to your lymph nodes or metastasizing to other organs. Additionally, BCCs that are found later can cause permanent damage to surrounding nerves and bones. The second most common type of skin cancer that Spring residents may develop is called squamous cell carcinoma (SCC). Like BCC, squamous cell skin cancer most frequently appears on fair skinned people, though patients with dark skin tones can develop it as well. 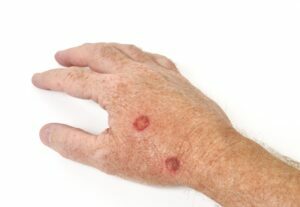 SCC usually presents as a firm red bump, a scaly skin patch, or a sore on your skin that constantly heals and reopens. Like BCC, sun exposure is a common risk factor for developing squamous cell carcinoma. A skin cancer screening, especially examining the rim of the ear, the neck, your arms, and the chest is needed to diagnose this type of skin cancer. Make sure to schedule your annual screening with Spring dermatologist Dr. Perri every year. Melanoma is probably the most well-known type of skin cancer, but not for a good reason; it’s the most deadly type of skin cancer there is. A melanoma typically presents as a new mole or an existing mole that is changing. While a skin cancer screening is especially important for anyone with a mole to detect melanoma early, it’s also important for those with moles to remember the ABCDEs of melanoma, so they know if they need to see Dr. Perri immediately in between their annual screenings. Regardless of your skin tone, skin cancer is serious business. Anyone can develop it at any point in their life. If you’ve never had your skin evaluated for signs of skin cancer, it’s time to schedule an appointment with Dr. Perri of Perri Dermatology to have a skin examination. To make this appointment, call Perri Dermatology today at (281) 943-2749.